The trigger mechanism is the single most important part of any hunting rifle. A good trigger breaks like a glass rod with moderate pressure, minimum over travel and is a joy to use. The trigger is more important to practical accuracy (how accurately a rifle performs in the field) than any other aspect of the rifle. A poor trigger encourages flinching, "flyers" and results in wounded animals. The trigger mechanisms supplied in commercial bolt action hunting rifles (not recycled military arms) from the 1920's until the late 20th Century were traditionally single stage and user adjustable for weight of pull (and sometimes sear engagement and overtravel as well). The trigger mechanisms supplied in Browning, commercial Mauser Model 98, Remington Model 700, Weatherby Mark V and Vanguard, Winchester Model 70 and the original Ruger Model 77 rifles were all of this type and exemplify the breed. These were all very good triggers right out of the box and could be fine-tuned as the shooter's preferences dictated. I have owned and used all of these rifles and their triggers could be easily user adjusted for a clean three pound release, which is my personal preference in a big game hunting rifle. Some European rifles were available with set triggers, of either single or double trigger type, which could be adjusted for very light release weights when "set." The drawback to this type of trigger is that it requires the shooter to waste time setting the trigger, which is then too light for many hunting scenarios, or pull through the creepy, heavy "un-set" pull. Set triggers are still available on some European models (CZ and Merkel, for example), but have never found much favor with North American hunters and will not be discussed further in this article. During the 1980's, gun makers began to be bombarded by nuisance lawsuits filed by anti-gun lawyers for conniving clients who managed accidentally to shoot themselves or others with their hunting rifles. Eschewing all personal responsibility for their actions, these bottom feeders blamed their rifle's manufacturer for the incident that they themselves had caused. Unscrupulous lawyers called ordinary hunting rifle triggers "hair triggers," fallaciously argued that they were inherently unsafe and convinced ignorant juries to award large settlements to their undeserving plaintiffs. As a result, gun company lawyers insisted that the gun manufacturers increase the pull weight of their triggers and seal or remove the user adjustable feature, and most complied. Triggers got creepier and heavier and bullet placement became more difficult, particularly for less experienced hunters, resulting in an increased probability of wounding big game animals. Most lawyer inspired trigger mechanisms were contained within housings intended to prevent user "tampering," and this is also true of the latest new trigger designs that are discussed below. The writers for publications such as Guns and Shooting Online railed against these retrograde triggers, experienced sportsmen were incensed and after years of complaints about the lousy triggers, the gun manufacturers began to get the word that their customers were not happy. Unfortunately, the wishes of those who were paying their hard earned dollars for new rifles were not as important to most manufacturers as the wishes of the lawyers and their fear of lawsuits. (Some companies, including a number of "high end" brands such as Browning, Kimber, Mannlicher, Sako and Weatherby supplied good trigger mechanisms in their hunting rifles, and still do, but they were in the minority.) There the matter rested for years. Savage Arms finally broke the stalemate by introducing their revolutionary AccuTrigger in 2003. This exceptionally clean, crisp trigger is user adjustable down to a pull weight of about 2.5 pounds (or up to six pounds) in Savage centerfire, muzzleloader and rimfire hunting rifles and immediately became the standard of comparison. The Target model AccuTrigger, standard in Savage target rifles, Law Enforcement series rifles and some varmint rifle models, is adjustable down to 1.5 pounds. Savage actually supplies complete trigger adjustment instructions and an adjustment tool with every AccuTrigger equipped rifle. 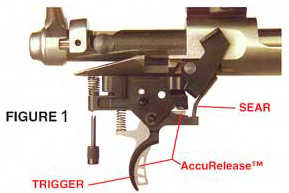 Savage AccuTrigger diagram. Illustration courtesy of Savage Arms. The AccuTrigger is also an exceptionally safe trigger that uses a Glock-like blade to prevent inadvertent trigger movement until deliberately pulled. Finally, there was a modern trigger mechanism designed by shooters for shooters. Savage CEO Ron Coburn later admitted that he brought the AccuTrigger to fruition by not telling his lawyers about the project. The AccuTrigger was so much better than the lawyer inspired triggers offered by the other "major" gun makers that some sort of response became a commercial necessity. Savage added fuel to the flames by adapting the AccuTrigger to their rimfire rifles, introducing many young shooters to a good trigger for the first time. The AccuTrigger remains the best of all OEM production triggers and the standard of comparison in the industry. Particularly in the rimfire rifle field, no other mass produced trigger comes close. Savage market share increased at the expense of the other major manufacturers, primarily because of the AccuTrigger. Eventually the other makers had to do something to improve their own triggers--or at least to allow them to advertise that they had. Marlin was one of the first makers to respond to the AccuTrigger, shortly after Savage extended the AccuTrigger to their rimfire bolt action hunting rifles. Marlin had been the largest US producer of rimfire rifles, until Savage gained that distinction after introducing the rimfire AccuTrigger. The previous Marlin rimfire trigger mechanism was, in a word, terrible, so the T-900 does represent a worthwhile improvement. Most of all, it allows Marlin to advertise an improved trigger. Illustration courtesy of Marlin Firearms. Guns and Shooting Online rifle reviews revealed that the T-900, while an improvement over the trigger previously supplied in Marlin bolt action rimfires, is certainly no threat to the superiority of the AccuTrigger. Although somewhat smoother than the previous Marlin trigger, its pull weight remains far too heavy. The T-900 is clearly a lawyer approved trigger. The Pro-Fire Trigger is a rather simple, two lever mechanism (trigger and sear) supplied in the recently introduced Model XL7 centerfire hunting rifle. This trigger uses an AccuTrigger like safety blade and is claimed to be user adjustable down to 2.5 pounds, just like the standard AccuTrigger. If emulation is the sincerest form of flattery, Savage should be flattered by the Marlin Pro-Fire, although internally the Pro-Fire is quite different from the AccuTrigger. The Pro-Fire was developed entirely by Marlin engineers and technicians. Trigger pull weight adjustment, after the stock is removed, is accomplished by loosening a lock nut and turning a set screw at the front of the trigger housing. The Pro-Fire trigger that I tried at the 2008 SHOT Show was good, but fell short of the crispness that I have come to associate with the AccuTrigger. This may or may not be the norm for production Pro-Fire Triggers; time will tell. Certainly, the Pro-Fire is a good trigger and it represents a big step in the right direction for Marlin. The Ruger trigger supplied in the M77 Mark II was a big step backward from the very good trigger mechanism used in the original M77. The Mark II trigger is creepy, heavy and not user adjustable. (It can be lightened by removing the trigger return spring and clipping off one link, but that is hardly "user adjustable" by normal standards and the excessive creep remains.) The Ruger M77 is a very popular hunting rifle, and generally deserves to be, but its trigger has been widely and justifiably criticized. The usual solution for M77 Mark II owners is to replace the stock trigger assembly with an aftermarket trigger. Ruger LC6 Trigger. Illustration courtesy of Sturm, Ruger & Co., Inc.
For years, Ruger refused to budge on the trigger issue, despite all the criticism the Mark II trigger received from practically everyone who owned one, including the reviewers at Guns and Shooting Online. However, the pressure from the AccuTrigger and other "improved" triggers made some improvement of the Mark II trigger necessary if the M77 rifle was to remain competitive in the marketplace. This was accomplished with the introduction of the M77 Hawkeye rifle, which incorporates the LC6 trigger mechanism. The LC6 is derived from the Mark II trigger with some internal and manufacturing improvements. Ruger advertises "smooth, crisp performance right out of the box." Guns and Shooting Online reviewed an early Hawkeye rifle and found the trigger to be even worse than the last M77 Mark II we had reviewed, creepy, gritty and heavy. The LC6 triggers that I tried at the 2008 SHOT Show were considerably better than the example in our test rifle. Either they were specially tuned for the SHOT Show or Ruger has improved their quality control. However, the LC6 is not user adjustable, is set for a (too heavy) nominal five pound pull at the factory and remains clearly inferior to the original M77 trigger as well as the Savage AccuTrigger and the new triggers from Browning, Marlin and Winchester. This is a shame, as anyone who has owned an original M77 knows that Ruger is perfectly capable of producing a good, adjustable trigger should they choose to do so. The Model 700 was introduced with an excellent trigger. It was light, clean and fully user adjustable. This became the benchmark trigger for American factory built rifles for decades. Because the Model 700 trigger was easily user adjustable, the Company lawyers eventually insisted that this fine trigger be set at the factory with excessive sear engagement and a heavy pull. The adjustment screws were then sealed with goop to prevent user tampering. Scraping off the goop to adjust the trigger voided the warrantee. However, for those adventurous souls who dared to do so, the Remington trigger could still be adjusted for a decent release. Remington has now introduced the "improved" X-Mark Pro Trigger. This revised version of the Model 700 / Model Seven trigger features highly polished engagement surfaces and tight quality control to mask what is actually a rather heavy factory set pull weight by providing a release with (supposedly) minimum creep. The X-Mark Pro trigger in a Model 700 that we recently reviewed was heavy and included a small amount of gritty take-up before it released with a clean break. The X-Mark Pro Trigger is advertised as "adjustable for pull weight by a qualified gunsmith," just like the Model 700 "lawyer" trigger it replaces. We have a qualified gunsmith on staff and we found that adjusting this new trigger for a decent release is a hassle. The X-Mark Pro trigger mechanism can be retrofitted to any older Model 700 or Model Seven rifle at a Remington authorized service center, but we recommend against doing so. Clearly, Remington simply needed something to advertise to compete in the new trigger war, and the X-Mark Pro is the result. This is not a new trigger mechanism, but in fact a very old one. The 798 rifle is, however, a relatively new model in the Remington line. Remington's commercial Mauser 98 based Model 798 centerfire hunting rifle is supplied with a fully adjustable (pull weight, sear engagement and overtravel) Mauser 98 type trigger mechanism. The 798 Owner's Manual pointedly does not mention this fact and the relevant parts have been excised from the parts diagram, but anyone familiar with the plethora of commercial Mauser 98 hunting rifles produced over the last century (or who has read the Guns and Shooting Online review of the Model 798) should have no trouble figuring out how to adjust the Model 798 trigger. Ironically, this old design is the best trigger mechanism available in a Remington hunting rifle today. Browning rifles have traditionally been supplied with very good triggers, so it is with a feeling of trepidation that I heard that the X-Bolt rifle had a new "improved" trigger mechanism. So often in recent years "improved" triggers have actually been lawyer triggers, inferior to the triggers that they replaced from the shooter's perspective. Thankfully, my fears were ungrounded in the case of the Feather Trigger System. This fully screw-adjustable, conventional trigger uses a pivoting three lever mechanism with chrome plated engagement surfaces to provide what may be the best trigger found in a Browning bolt action rifle since they were based on FN Mauser actions. The samples that we tried at the 2008 SHOT Show provided a light and clean release that is superior to most of the competition. (It feels much like a Weatherby Mark V trigger.) The Feather Trigger boasts zero take-up, virtually no creep and minimum overtravel. The factory set pull weight is rumored to be 3.5 pounds, but the Feather Trigger can be adjusted for pull weights between for three and five pounds. Based on the same triple pivoted lever design principles as the Browning Feather Trigger System and engineered by the same design team, the Winchester M.O.A. trigger is essentially a Feather Trigger adapted to the Model 70 rifle. From its introduction in the 1930's, the Model 70 had an excellent, user adjustable trigger. The old Model 70 trigger, however, required careful manufacturing, fitting and adjustment for top performance. These were sometimes lacking in recent years. The new M.O.A. trigger mechanism boasts a 2:1 mechanical advantage and the new Model 70 rifle is supplied with a wide trigger blade that minimizes the subjective pull force required to fire the rifle. The examples that we tried at the 2008 SHOT Show were excellent and no doubt easier to manufacture and tune than the old trigger mechanism. The factory set pull weight is specified as 3.75 pounds and the adjustment range as three to five pounds. There are adjustment screws for overtravel and pull weight. If it lives up to its initial promise, the M.O.A. may be the best Model 70 trigger yet, joining the Savage AccuTrigger, Marlin MOA and Browning Feather Trigger at the top of the new crop of trigger mechanisms. Some of these new triggers represent the solution to a vexing problem, the lawyer inspired triggers of the last 20 years. The benchmark Savage AccuTrigger is at the forefront here. Others, as you have read above, are more advertising sizzle than substance. The Browning Feather and Winchester M.O.A. triggers are interesting because the A-Bolt and Model 70 triggers that they are replacing were already far better than average. These appear to be honest attempts to make a good product even better. Given the importance of a proper trigger to a good hunting rifle, it is worth pondering the validity of the claims for these new triggers before purchasing your next rifle. Copyright 2008 by Chuck Hawks. All rights reserved.